Wouldn't it be great to watch movies for school? That's sort of what happens at the Palace Theatre. Each year Oakley High School students apply for the class that runs the theatre. Students run equipment, schedule workers for the concession stand, pay the bills and learn the business of running a business. 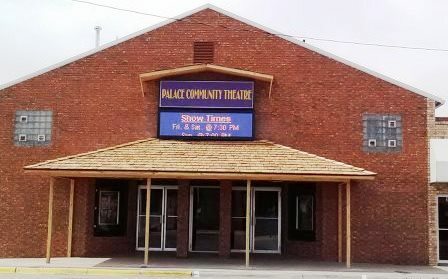 The idea is unique enough that the Palace Theatre has been featured in People magazine and on ABC national news. Local businesses sponsor movies that are shown each Friday, Saturday, and Sunday evening. Check the website for movies and show times. Spring of 2013 The Palace Theater got a face lift - complete with new LED sign for movie showings.